What Is the Difference Between a Plastic Guitar Pick & a Metal Guitar Pick? While plastic guitar picks are the most common type and are found in music stores both in town and online, you can also use metal picks. It all comes down to sound preference, and there are distinct differences with each type. In order to know which you prefer, it is wise to research and then try each type to make an informed choice. Metal guitar picks weigh more than plastic guitar picks, so the one you choose may be related to your tolerance for fatigue that you may experience in your hand while playing. Heavier picks will take getting used to and many guitarists prefer plastic; they are the most common type available at music stores and online. While metal picks may weigh more, they have special characteristics that some prefer, so they deal with the weight issue through constant use which allows them to get used to the extra weight while playing. Similar to plastic picks, metal picks come in various types including bronze, stainless steel and copper. They all vary in weight as well as durability. Bronze picks are the heaviest while cooper are easy to bend and thus weigh less, closer to the weight of a plastic pick. Plastic guitar picks can be made of various types of plastics including celluloid, nylon and Tortex. Nylon picks are the most common of the plastic types and can be made very thin. Both metal and plastic picks can be made to the same shape. Picks of different materials wear differently based on the overall usage. Celluloid and nylon plastic picks wear the best and are the stiffest. Tortex is third and wears well, but also is easier to grip that nylon or celluloid. The quickest to wear are picks made of Lexan, which is a soft plastic. Metal picks wear slower than plastic ones, with stainless steel lasting the longest and copper wearing out the fastest. 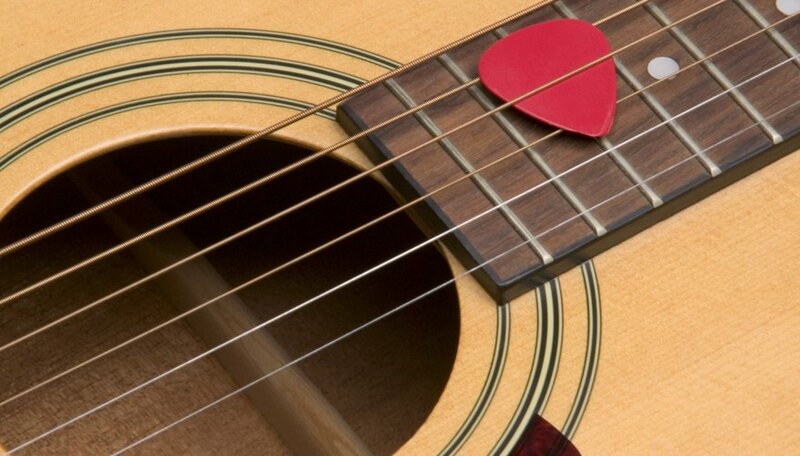 However, metal picks also wear out your strings faster than plastic due to the metal on metal contact. Metal picks are sometimes used for rock guitarists as they can give you a bright sound that may be desirable for some heavier musical styles. While plastic picks are perfectly suited for guitar, many desire the crisp, metallic sound that is created by a metal pick. If playing fast solos, a thin plastic pick my be the best choice, but stainless steel picks sound great for heavy-handed rhythm playing. When playing blues guitar, a metal pick would not be desirable if you are after a warm sound from your guitar. How Do Picks Change the Sound Your Guitar Makes? What Are the Sizes & Weights of the Tenor Sax vs. the Alto Sax? What Equipment Is Needed to Play the Electric Guitar?